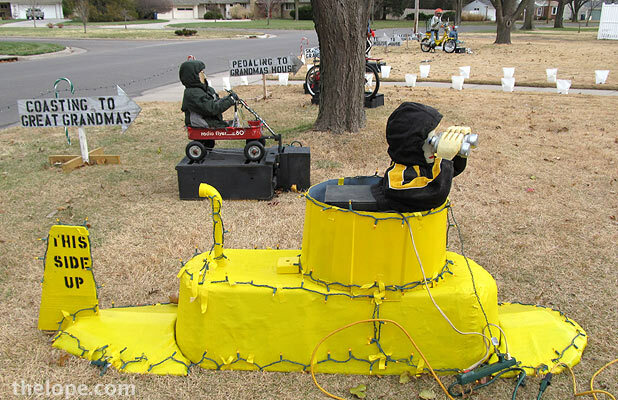 Hutchinson's own nuclear scientist turned Yuletide inventor has been at it again, and there's another way to get to Grandma's House - a yellow submarine. I keep wanting to call it "The Hunt for Yellow December". Dale Hankins, retired nuclear safety expert, has created automated Christmas decorations almost annually for over twelve years. 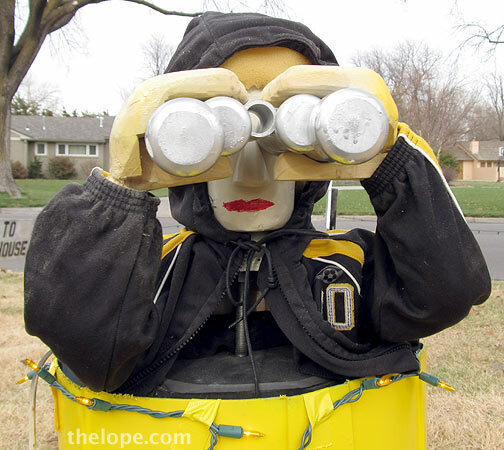 These portray methods of travel to Grandma's House and are displayed on his lawn at 25 Countryside Drive in Hutchinson, Kansas. Grandma herself, Dale's wife, Betty, passed away in 2009 but the family keeps the display going in remembrance. 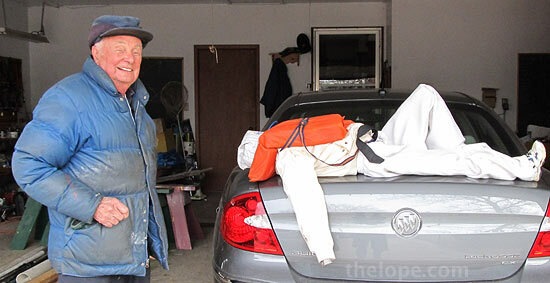 Dale told me he originally wanted to paint the sub silver but was convinced to go with yellow for the Beatles song. He also says he's about out of ideas, but somehow I can't believe that. Imagine what he could do in the future: rocket (authentic or 50's retro with fan-blown red-spotlit fabric exhaust), space shuttle (opening bay doors), swinging on vine, riding a dinosaur, streamlined train, steam locomotive (fog machine in smoke stack)...there's a lot left for Dale's personal R&D department to tackle. I got a chuckle out of one of the "grandchildren" laid out on the trunk of Dale's car. Dale was getting ready to shorten it a bit as it's the one that goes in the sailboat and part of the rigging was hitting the top of its head. This trailer holds the roller coaster tracks, the largest of the displays. I've photographed the changes in Dale's display for a few years. Here is 2009, 2008 and 2007. I'll photograph it again this year once it's finished. I'm always floored by the uniqueness of Dale's display and can't believe it's not better known. 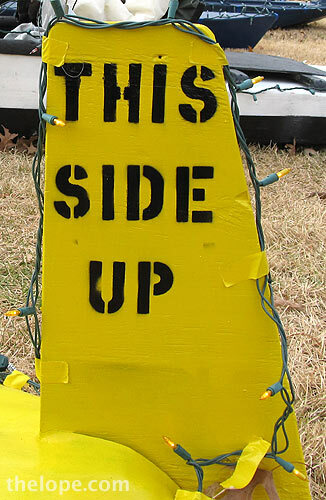 Maybe we need an "Eight Wonders of Yuletide Kansas."